For those of you who have followed me as a member of the House of Delegates, you already know that I am a committed conservative. You know that I have been a voice for families, small business, and constitutional governance. And you also know that I have been a leader in the General Assembly, insisting on audits of the government to find waste, fraud, and abuse, fighting tax hikes, reining in useless law suits, and demanding school accountability. And I have worked hard to ensure our budget is balanced, our debt is low, and that we have money set aside in our "Rainy Day Fund" as a hedge against future economic downturns. In other words, my service is the exact opposite of what we see in Congress and the White House today, namely, complete dysfunction. If you want to be able to say "Hey, I helped a guy who actually gets the work done, is a real conservative, and understands that government must also be responsible to the tax-payers", then you can start right here. Midnight tonight is a critical reporting period for my campaign. So please take a moment today to visit my website and contribute to our campaign! Please help me reach a goal of $5000 by midnight tonight. That's just fifty $100 donations and we can get there if you will help me today! I know everybody is tapped. Shelley and I are, too. But I depend on folks like you to help me fight for the Founding vision. Please consider $50, $100, $250, $500 or more. We are in the final days of this campaign and I need your help now so we have time to get our message out in these final 36 days of the campaign season. Please help today! 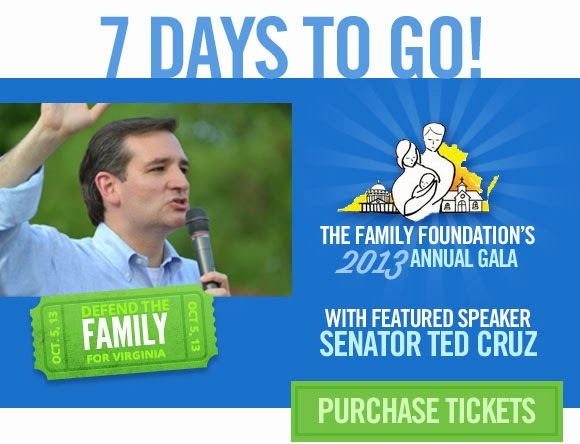 In only seven days, Sen. Ted Cruz will address the largest political gathering of conservatives in Virginia. Do you have your tickets, yet? Pasta on the Patio with Delegate Pogge--RSVP today!